Nothing like bringing in a little exotic flavor to a birthday don't you think? And Hawaii is just oh so dreamy and what I would give to celebrate my birthday there! 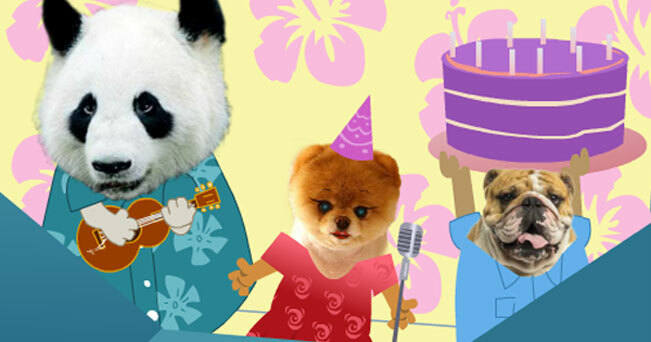 Well Panda with his ukulele and the beautiful singing Doggy Wahine take you right in the midst of the island and it's delights with this electronic greeting card. The idea came up when one of our Production Trio member shared they wanted to learn the ukulele and as we chatted, the idea popped up and we brought it to reality with this musical ecard. It has become a popular birthday ecard and a little exotic flavor to a birthday is just so lovely! Send this panda ecard today.